webCDcreator offers users the possibility to copy files from their computer to a PC with a CD-burner which is connected to the network. 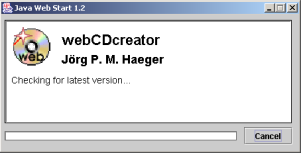 The user compiles the contents of the CD by using the webCDcreator, which then creates the CD. The webCDcreator allows multiple users in the network to make use of the CD-burner. The GUI (Graphical User Interface) is written in Java. This ensures a high level of platform-independency. The webCDcreator runs under any operating system, as long as it has a Java VM (Virtual Machine) available. Examples of these OS's are Microsoft Windows, Linux, BSD and MacOS. 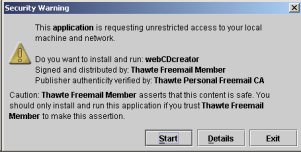 The first time webCDcreator is started on the computer, the user will be asked if the program can have unlimited access to the computer's resources. This has everything to do with the philosophy of Java, where program code (that can have been downloaded from the internet through the browser) cannot be executed without the user's explicit permission. Click the [ Details ] if you want to read more about the certificate by which the creator of webCDcreator has digitally signed the software package. Click on [ Start ] if you consider the program to be safe and want to start using it. The first time a workstation connects to the CDWserver, the workstation and/or browser has to be configured to work with the webCDcreator. To achieve this, click the link "Start Page" in the left pane of the main page. Make a choice concerning the Java support that best fits the working environment. Some people might prefer the use of the "Java Plugin", by which the webCDcreator application appears within a browser window. Others may prefer the "Java Web Start". In this case, the webCDcreator application will work independently from the browser, and can even be started without a browser if so required. Users with a slow link to the webCDcreator server may prefer the latter option. After this one-time configuration (which is clearly documented), the webCDcreator application can be started. After starting the webCDcreator application, the main screen will appear. At that moment, a connection request is made from the program to the server. If this request is granted, a dialog-popup will appear with information regarding the version of the program. If so required, other local information can be included in this popup (like service messages from the system administrator). If the request is not granted, an error-popup will be shown, and the program will close itself. If this happens, it is recommended to wait a short while before attempting again. If waiting does not solve the problem, the system administrator should be notified. In case of a default installation, everybody can use the server's functionality across the network without limitation. The system administrator can however decide to block "anonymous" access. Users will then require a login account on the webCDcreator before the application can be used. If the system administrator did indeed make this decision, a login dialog popup will appear after the initial welcome popup. Users already having an account on the webCDcreator can enter their username and password here. Others will have to press [ New... ] in order to choose a unique username. Furthermore, the user is required to enter a valid email address, as the server will send a randomly generated password to that address. After receiving the email, users can login using the chosen username and provided password. It can take a short while (usually no more than several minutes) before the password is sent. It is strongly recommended to change the password as soon as possible. To do this, select the pulldown menu Settings -> Password. After a successful login, the webCDcreator is ready for use. 3.1 "Add Files or Folders to a Data CD"
Choose this option if the files on the local harddisk are organized in a directory structure, and this structure has to be copied to the CD. 3.2 "Write an "ISO 9660 Image"-file"
Use this option when a CD-image file is already available. This ISO image (which usually has .iso as a file extension) must be burnt onto a CD in a special manner in order to preserve the characteristics of the original CD, and to be able to correctly read the actual contents as it was present on the original CD. Example: Bootable CDs are often electronically distributed as ISO files. 3.3 "Burn an audio CD"
With this option, a user can burn wave files (.wav), MP3 files (.mp3) or OGG files (.ogg) onto the CD in audio format, so normal CD-players (home, car, computer) can play these CD's. Note: WAV files only with a 44.1kHz - 16 bit format can be used. The system administrator can decide to disable this functionality. 3.4 "Copy a non-'copyprotected' CD"
Use this option to create a 1:1 copy of a source CD. For this to work, a second CD-drive (usually a CD-ROM) has to be mounted as well. 3.5 "Erase a CD-RW or DVD+RW"
Use this option to erase a rewritable media (CD-RW or DVD+RW). There are two ways to do this: the fast way (only the TOC - table of contents is erased) or the thorough way (the complete contents is erased). The fast way usually takes no longer than a few minutes. The main screen is devided in two panes. The left pane shows the available resources (local drives, network drives, removable media). From there, the sourcefiles can be selected which have to be burned onto the CD. The right pane shows the actual status of the directory listing of the CD that is being compiled by the user, which is intended to be written to the CD. The available resources can be local drives, network drives and/or removable media. It can however also be a directory on the local harddisk of the webCDcreator. Files that are often requested can be put there by the system administrator (templates for instance), so they need not to be transferred across the network every time. Above the right pane, the format of the destination CD/DVD can be chosen from a pull-down menu. At the bottom of the right pane, a status bar gives realtime information about the amount of used and available space on the CD. A red bar indicates the amount of data that does not fit onto the CD. In the case of audio CDs, it will indicate the number of minutes (playtime). In case of data CDs, it will show the amount of megabytes. Select the parent directory in the CD description box. Enter the name of the new directory and hit return. Select one or more files and/or directories in the sources box. (tip: use the (shift) or (Control) key on the keyboard when clicking the mouse to select multiple files). Select the target directory in the CD description box. Copy the selected files by clicking on [ > > ]. Select one or more files and/or directories in the CD description box. Select the file or directory in the CD description box. Click a second time on the selected item. Add WAV, MP3 or OGG files to the compilation, as described in paragraph 4.2. With the and icons, the sequence of the tracks can be altered. After the selection has been created the CD can be written. select the pulldown menu Action and then the menu option burn session. Important: insert the CD-R after it is requested by the program. The options you choose for the CD can have a big effect on the useability of your CD. The volume ID is the name of the CD you will see, for example, in Windows Explorer. For data CDs, webCDcreator will make a standard ISO data CD with the Microsoft Joliet and Unix Rockridge extensions. These extensions allow the use of long file names on CDs for Microsoft and Windows systems respectively. The Joliet extension allows long file names on an ISO CD, but be aware that the longest name permitted is 64 letters plus extension. If files have more than 64 letters in their name before the extension, they will be truncated to 64 letters. If you have 2 files in the same directory whose names are indentical for the first 64 letters with the same extension, you will have an error. Note, this has happened before! The Rockridge extension allows long names on CD compatible with Unix systems. This option will create a CD readable on older Apple Macintosh machines that do not support ISO images. This CD will not be readable at all on most Microsoft and Unix systems (except recent linux kernels). Here you can set the speed at which the CD will be written. Please ensure that the CD you are writing to supports the speed you choose. You can choose to simulate the write operation, in which case the writer will do everything normal, except with the laser off. This still requires that a writeable CD (preferably the one you are going to write on) be inserted. This will mean that you can write no more data onto the CD (unless it is a CD-RW, in which case you must choose "Overwrite CD" next time). Some CD-ROM drives (typically pre-1999 drives, normally 24-speed or slower) can only read a CD-ROM correctly if the CD is closed. These CD-ROM drives may also only see one session on a multi-session CD. If you may want to read a CD-ROM on an old drive like this, it is suggested that you write one session only and close it. This option will mean that the application will close, and you will get no notification that the CD is ready. You may want to use this option if you will be restarting your machine while the CD is busy. After setting the desired options for the burning session, proceed with the [ Next >> ] button. A final warning could be shown, if a rewritable media is to be erased. The webCDcreator program will then copy all data to the server across the network. The time it takes can vary from several minuts to hours, depending the network speed and the amount of data. When all data is stored on the server, the burner's CD-tray will open (in case of a "tray-loading" burner) and the webCDcreator will display a popup requesting the insertion of your media. Due to the fact that the webCDcreator operates across a network, the burner will be reserved for your burnjob (default: 10 minutes). If no media is inserted during this time period, the burnjob will be cancelled. Reason for this behaviour is, that users can compile their CD's simultaniously with webCDcreator. The queue that this will generate will be handled by the server one at a time. By restricting the reservation period the system administrator can influence the length of the queue. The system administrator can decide to run more than one burner, when queues are found to be too long. In the notification popup that appears, the webCDcreator will also mention the sequential number of the burner along with the reservation time where the user's burnjob will be queued. The system administrator will have to label the burners accordingly. Once a media has been inserted and the tray is closed (either by pushing the button or gently pushing the tray close), the webCDcreator will display a progress-bar which indicates the progress of the burning process. By pressing Details, the messages from the burning software to the server are displayed as well. If the option "Offline burning" is chosen, the webCDcreator application will be closed as soon as the burning process starts. The progress of the burning process can still be viewed on the webCDcreator's status web interface. Can I also create an audio CD (music CD) with webCDcreator? Yes, just select Audio CD in the first window that appears when the applet starts.